Jake Gardiner – Yahoo (365 rank) -- Gardiner led the Maple Leafs in on-ice Corsi in 2012-13 (small sample size of 12 games) with -1.19, a negative possession number, affirming the notion that the Leafs were a terrible possession team. Gardiner was also tops on the club with a RelCorsi of 30.5. JG had the greatest impact of any Leafs skater on his team’s possession in limited regular season use last year. In 2011-12 under Ron Wilson, Gardiner played 75 games and ranked 6th on the Leafs in on-ice Corsi (0.28) and 9th on team in RelCorsi (2.6), while ranking second among Leafs’ Dmen behind Franson with a .94 5v5 P/60. Simply put, Gardiner has been a boon to his team’s possession figures over the course of his young career. This guy is a steal at his Yahoo ranking, and should be selected somewhere in the last few rounds of your fantasy draft. Even with Phaneuf and Franson in the fold for TML, Gardiner has too much skill and speed to be held off the score sheet in 2013-14. Torey Krug – Yahoo (897 rank) -- Torey Krug is pretty much a household name after his emergence during last year’s playoffs with the Boston Bruins. Through 15 postseason games, Krug ranked 6th on the B’s in on-ice Corsi (10.47) and 1st overall in RelCorsi (20.1), while posting .92 5v5 P/60. Krug’s playoff success is admittedly a small sample size, but the undersized rearguard has looked good in preseason action, and is slated to line up on one of the points with the Bruins’ PP1 unit. Sophomore prospects are good for this former MSU Spartan defender. There isn't a whole lot to go on statistically, but Krug definitely passes the "eye test" and early reports are remarkably positive. Take a chance on Krug in the late rounds of your fantasy drafts. 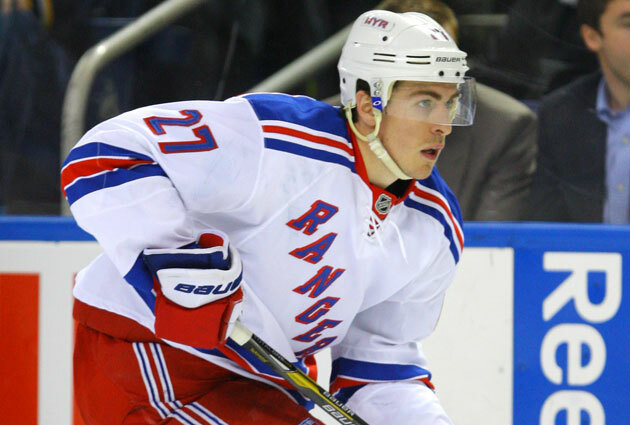 Ryan McDonagh – Yahoo (216 rank) -- Anyone who knows anything about NHL hockey knows the name Ryan McDonagh. Acquired by the New York Rangers in the deal that sent Scott Gomez to the Habs, McDonagh has been making the Rangers look like brilliant strategists ever since. While McDonagh’s point production hasn’t been very noteworthy (60p in 169 career regular season games), his production in other areas has solidified his status as a worthwhile Dmen in fantasy leagues that score peripheral categories such as +/-, Hits, Blks, etc. Over his career he’s been good for basically a PIM every other game, 1.5 Hits per game, and 2 BLKS per game. McDonagh also holds a career +54 rating. So while McDonagh isn’t an offensive dynamo, he holds value as a “Jack of all trades,” and there is reason to be optimistic. Many have lauded McDonagh as having a Norris-worthy skill set; however, trapped in a defensive scheme under Tortorella, McDonagh has been unable to consistently display his offensive flare. This could all change under Alain Vigneault if his offensive-zone usage sees an uptick commensurate with his skills. With a track record of putting his best offensive players in the best offensive situations on-ice, Vigneault could have a major impact on this young Dman in 2013-14. Who knows? A Norris bid could be in the cards, and wouldn’t surprise this commentator one bit. Cam Fowler – Yahoo (237 rank) -- Cam Fowler is pretty much the definition of a boom-bust Dman. He has the offensive skill set to match up with the best rearguards in the NHL; however, his defensive acumen often leaves something to be desired. Highly regarded after his 40-point rookie campaign in 2010-11, Fowler has since been on the decline having posted sub-0.5 PPG seasons in back-to-back years. Working in his favor for 2013-14 is that Sheldon Souray will be on the mend for the next few months after suffering a wrist injury in the offseason. Fowler will have every opportunity to improve upon his past two seasons, and will likely get PP1 time for at least the majority of the year. The real value here lies in point production, but Fowler will also post modest SOG and BLKs totals. Take a late-round flier on this highly talented Dman hoping for a bounce-back season. Radko Gudas (Hits/PIMs) – Yahoo (662 rank) -- This is the guy I really, really wanted to write about going into this season. Radko Gudas is someone that many of you probably don’t know, leaving a lot of you thinking, “Radko who?” Well, Gudas is a rough and tumble Dman who made his NHL debut last season with the Tampa Bay Lightning. While only appearing in 22 games in 13-14, the Prague, Czechoslovakia native recorded almost 4 Hits per game (3.95), 2 PIMs per game (1.73), and over 1 BLK per game (1.27). While you might think a player of Gudas’ ilk would only be good for these stats, you'd be sadly mistaken. Gudas finished 2013-14 (22 games) with 2 goals, 3 assists, 31 SOG, and a +3 rating, which prorates to 7 goals, 11 assists, +11, 142 PIM, 115 SOG, 324 Hits, and 104 BLKs over a full 82-game schedule. If Gudas can put up anywhere close to those kind of PIMs/Hits totals, while chipping in a bit on the offensive side of the puck, he will hold immense sleeper value for the 2013-14 campaign. Reports out of Tampa Bay that Gudas will likely have more responsibility and ice time this year only bolster the rowdy Czech’s value going into fantasy drafts. Take in the late rounds of leagues that count Hits/PIMs. Tags # defense # dylan # fantasy.